Lacing the modern-day story with excerpts from the fictional diary, this book is an effort to kindle interest in the War of 1812 and its significance to the present, mixing in adventure, mystery, and discovery. On that account it has some success. The diary excerpts, the best part of the story, are short, staccato bursts of an authentic voice of a girl of the period writing on scarce paper, neither too literary nor too sentimental to be true. The trio attack the mystery with abandon, encountering many false starts, and using some real deductive reasoning � such as positing the position of the original settlers' cabins using the British conditions of settlement at the time The facts and legends behind the story are well documented, and real resources, from books to the Internet to the local library, are used. The suspense and interest, however, are not particularly well sustained. The book has a few too many ups and downs, excited bursts of discovery followed by disappointment, not to mention unimportant details of the teens' life, such as what they eat for breakfast before digging up the cabin cellar, or Ben's constant need for sunscreen to protect his fair skin. There is a good deal of jumping to conclusions on the group's part that go beyond youthful abandon � such as their certainty that, even if the legend is not true, gold must have been buried by an army paymaster in their neighbourhood at some point in history. 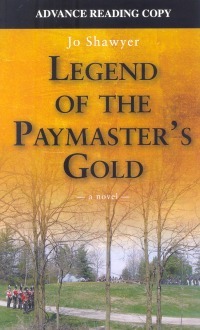 "The Legend of the Paymaster's Gold" is also constantly referred to in capitals, as if it is the name of a book or a real literary work, which it is not. After so many digs that have come up empty, the discovery of the gold coins at the end comes across as a bit anticlimactic, as though it was either a rushed or overly delayed conclusion.